In July 2018, Scorpios, under positive influences of the planets, will gain self-confidence and increased self-esteem, thereby feeling more in their power. Some under this Zodiac sign will start a new career, and may get so caught up in professional growth that they'll experience sleepless nights and long hours, without much rest. For those Scorpios whose health and wellbeing is more important than material benefits, go on vacation. Perhaps spend an unforgettable day at the beach, go to the dacha with close friends and family, or practice self-care and personal development. Scorpios are people who clearly know what they need, how to achieve their goals, and what resources they need for success. 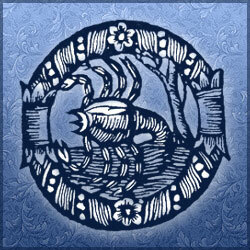 Pragmatic and practical, Scorpios can achieve their goals and conquer new things with minimal effort, while leaving behind rivals and envious people. The beginning of July 2018 will be marked by a period of positive events for Scorpios. Astrological influences for this sign will affect sociability and the desire to be at the center of everyone's attention. During this time, Scorpios will attend various events, corporate parties, gatherings, and even hectic parties. Family-oriented Scorpios can expect quarrels with loved ones in public, unless participating in public life isn't your thing. If the Scorpio is constantly on the road and working, while their partner misses home, it can lead to tension in the relationship. Perhaps it would be wise to find common interests. But take care to also spend time with your partner at home, especially if they don't like being in the public eye. Try compromising, so that both of you will be satisfied with the chosen style and pace of life. Only then can you achieve mutual understanding. In the middle of July 2018, some Scorpios will experience higher intuition and psychic abilities due to planetary influences, making it much easier to foresee and solve complex problems. In this period it is worth analyzing your life, your values, and your beliefs, which have guided you in making important decisions thus far. If your current situation suits you well, you can continue to act in the direction of your chosen path. But if you crave a better and more comfortable life, then try to slowly give up your old habits and find new, more useful ones that will lead you along the path to a happier and more prosperous future. To understand yourself and your needs, read useful literature on self-improvement, or perhaps talk with a loved one, particularly someone who can just listen without telling you their opinions. This kind of conversation will help you understand and restore order in your own thoughts, helping you move forward and align your priorities in the right direction. The end of July 2018 will be the most peaceful and harmonious period for Scorpios this month. Planetary influences under this sign will reduce excitement and ardor in professional achievements. Scorpios will focus on spending time at home, with their closest family members who giving a kind of peace and stability only family can provide. Most investment during this period should not be related to business, but to the family. Spend time away from city life and in the company of family, and perhaps even work on improving your relationships. Even the most time-consuming and boring tasks can bring joy if they're done together. Feel yourself and your family connected on a greater, more meaningful level, as one whole universe that cannot be penetrated.